Frankfurt-based studio Deck13 Interactive has been active since 2001, but it only got into the gaming industry’s spotlight with 2014’s action-RPG Lords of the Fallen. Arguably the best Souls-like game until the recent Nioh, the game did well enough that publisher CI Games announced a sequel, which will not be developed by Deck13. 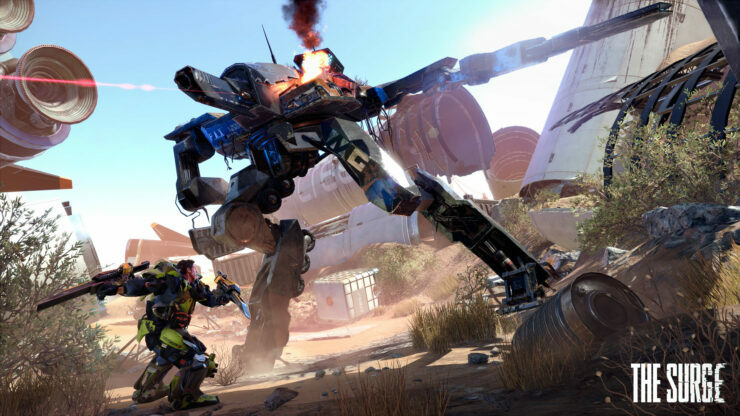 The German development team instead switched publisher to Focus Home Interactive and went on to make The Surge, a similar kind of game set in a dystopian future where Earth is nearing the end of its life. We’ve covered the game extensively throughout its development, including a Gamescom 2016 eyes-on preview and a recent hands-on at What’s Next de Focus. As part of our coverage ahead of the May 16th launch, we talked to Deck13’s PR & Marketing Manager Michael Hoss and Principal Programmer Benjamin Glatzel about the game’s technical specifications and differences with Lords of the Fallen. Look forward to our review soon. What are the main improvements you feel will differentiate The Surge from Lords of the Fallen? Michael Hoss: You mean besides the setting? Quite a lot actually. But I think the one thing that stands out the most is the combat system and the fact that this time you don’t choose a class at the very beginning of the game. When Lords of the Fallen was released, many players chose a class which didn’t fit their playstyle as they expected something different. This time we let the player chose his own playstyle through implants, armor and weapons. That way players will basically be able to create their own class. Do they prefer to be a tank and take damage or be more agile and deal lots of damage? While I’m talking about being agile: Many people said that the combat in Lords was rather slow. Well, we changed that. The whole combat system got rewritten and we’ve introduced a unique loot system. You could say you have to pay the iron price: you can only get what you cut. Also, the whole system is really combat driven. The more combat oriented the player approaches the game, the more he will be rewarded. In a previous interview, we’ve read that you may be looking at adding co-op support after launch. Is that still a possibility or perhaps something to consider for another game? Michael Hoss: Currently that is not planned for The Surge. Do you have a DLC plan already in place for The Surge or will it depend on the game’s reception and sales? Michael Hoss: Right now we’re super excited to see how The Surge will be received. That’s all we can say. You’ve announced that PS4 Pro users may choose between a dynamic 4K@30FPS mode and a 1080P@60FPS mode. Are there any graphical differences (like textures, effects) etc. between these two modes other than resolution? Benjamin Glatzel: Both modes offer the same range of visual effects and the same texture quality. The only differences lay in the resolution and the refresh rate. Can you give us specifics on the dynamic 4K mode, such as the minimum and maximum resolution ranges and the average range according to your estimates? Benjamin Glatzel: In ‘Quality Mode’ mode we’re offering an internal render buffer size of 1620p. There’s *nothing* out of the ordinary going on here (neither Checkerboard Rendering nor 4K Geometry Rendering). Instead, every rendering pass in the background is actually processed in 150% of the base resolution. So even passes that are processed in a lower resolution, like parts of our particle rendering, fog volumes or volumetric lights, benefit greatly. The Surge will get an HDR update shortly after launch. Was it hard to add this to the game? How much of a graphics improvement do you think it is? Benjamin Glatzel: The HDR feature was added pretty late in the production cycle. Thus neither the lighting nor the post-processing content were specifically set up with this feature in mind. To sum up the integration process: we just had to adjust a few of our rendering passes, change the backbuffer format and provide the correct tone mapping operator in our post processing pipeline. Enabling HDR in The Surge won’t be a game changer, but the gain in color range and light intensity is clearly noticeable. Will HDR be available on all platforms (PS4, Xbox One S and PC)? Benjamin Glatzel: Currently the HDR support has been announced for the PS4 and PS4 Pro. That’s all we can say right now. Benjamin Glatzel: Given the current state of our rendering backends and given the specs of the Scorpio, 4k @ 30 FPS might be really close. Sadly we didn’t have the chance to touch the Scorpio – yet. How much of a benefit will the extra RAM (12 GB GDDR5) compared to PS4 Pro’s 8GB GGDR5 +1 DDR3 be? On the flipside, PS4 Pro can handle 2×16-bit ops at once unlike Scorpio – will that help close the performance gap a bit? Benjamin Glatzel: We’re not using any sort of streaming system in our engine. Thus all our resources for the currently active level have to be loaded into memory and *stay* loaded till the player leaves the level. So, the more memory we can get our hands on, the higher the texture resolution might turn out in the end. On PS4 we’re actually pretty close to the available resource limits and the additional memory on the Pro came in handy to support the bigger render targets needed for the ‘Quality Mode’. We’ve already utilized half precision floating point arithmetics on the Pro for a couple of shaders and the gain was clearly noticeable. These optimizations were one of the many steps we had to undertake to break the 60 FPS mark in ‘Performance Mode’. We’re planning to improve upon that in the future as we are permanently improving our engine and we’re also pretty confident that we’re not remotely close to what the PS4 Pro can actually handle. Benjamin Glatzel: We are constantly improving our engine and we planning to overhaul a lot of our engine subsystems in the future – learning from all the issues we’ve encountered during the development of The Surge and past projects. Alongside revamping our engine core, we’re also planning to modernize the render system and all of our rendering backends. Vulkan will be a fundamental part on PC and DirectX 12 will be the candidate for the primary graphics API on Xbox One.